I am constantly amazed at the skills of my students and this project was no exception … especially with regard to the boys. 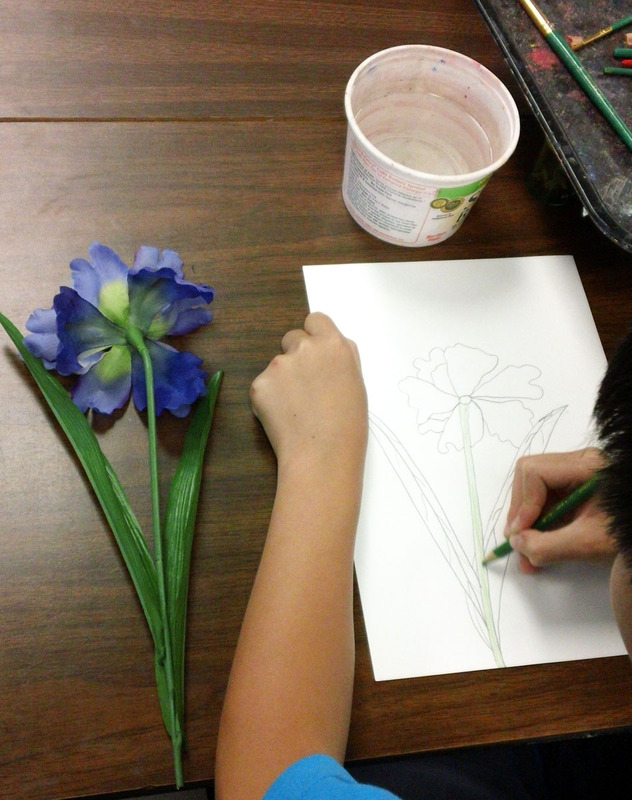 Painting flowers isn’t generally their favorite thing to paint, but it takes a lot of patience to paint botanical illustrations and they were up to the challenge. We began with quite a bit of discussion about how the point of botanical illustration is to accurately record the plant in all its forms. 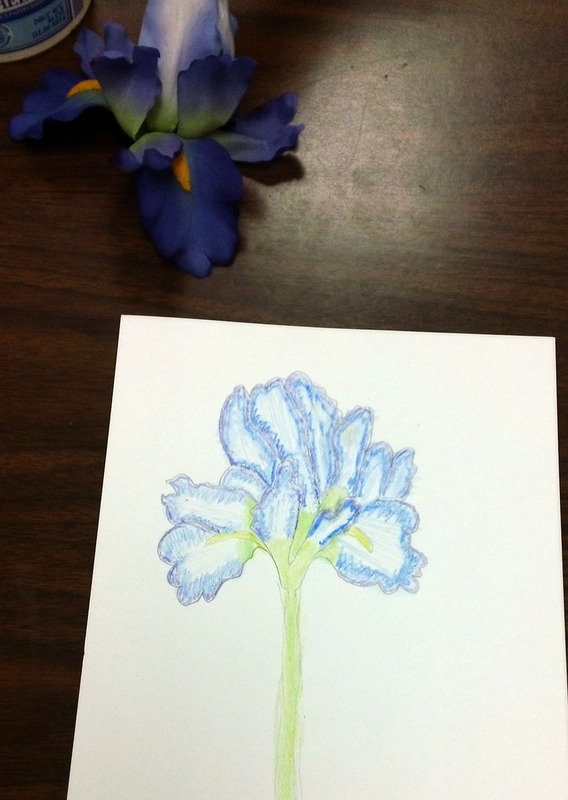 Botanical Illustrations began as a scientific study that turned into an art form. Artists work very hard to exactly represent the plant, down to dissecting the pods, showing what it looks like underground (roots, bulbs etc), showing leaves, flowers and other parts in all their different forms. Then they “glaze” watercolor in many sessions to get the colors just right. 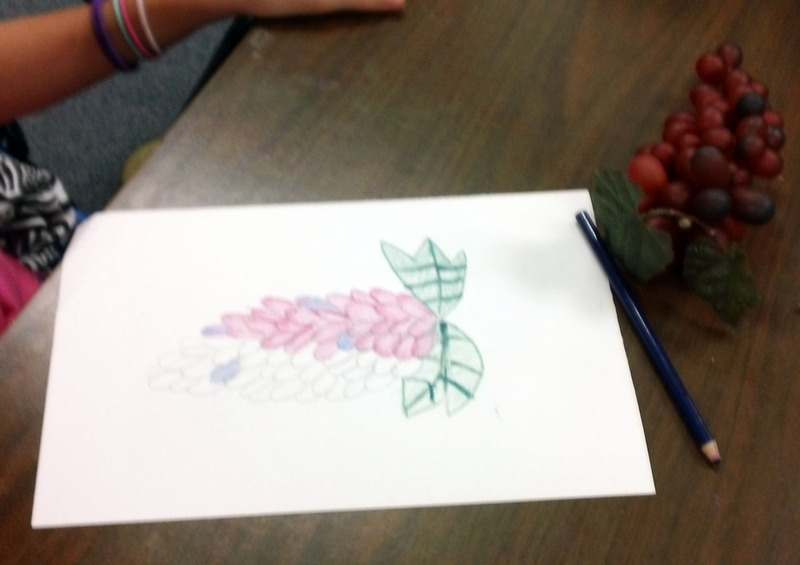 I had a wide selection of plastic fruit and flowers for the students to choose from and they started their drawing. Of course, we didn’t worry so much about the roots etc, just the flower/fruit and a stem and leaf. Given our already tight time constraints, they worked exceptionally hard to get as far as they did. 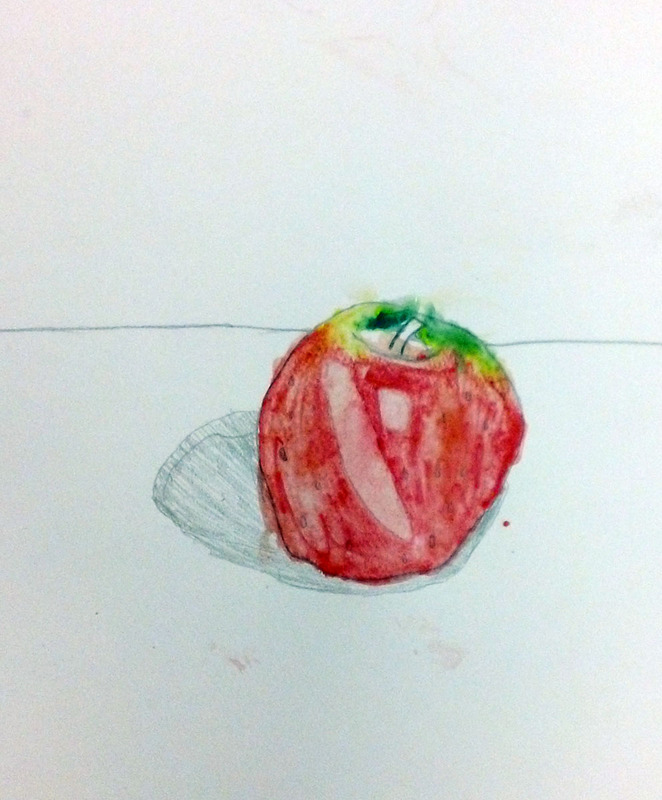 After the sketch was done, students used watercolor pencils to add the color. We talked about the blending of colors and how that helps with low lights and high lights and showing where one pedal ends and another begins (or one grape …) I asked them to work with a minimum of 3 colors … starting with yellow (which I believe to be the foundation color for nearly all things “natural”. Being fifth graders, they have a really good background in color from all our other classes and they did a remarkable job thinking about color mixing and how it would help or hurt their painting. All in all, it was a great send-off project for my lovely fifth graders… they are off to middle school! This is my first group that I have taught from first grade on up and I really believe it shows in their work! Good luck to them all! About Laura ... I am a Creative Soul. An Artist, Elementary School Art Teacher, and Mom. I believe everyone is creative, it is just a matter of finding their strength and building their confidence. I hope CreArtive Sparks helps put a little creativity in your day!